Place the dried fruits in the milk and leave them for 20min to puff up. Then, remove the fruits, add the sugar, the vanilla stick and the mastic powder and bring the milk to a boil. Let it cool off for a while and stir in the water-dipped gelatin sheets. 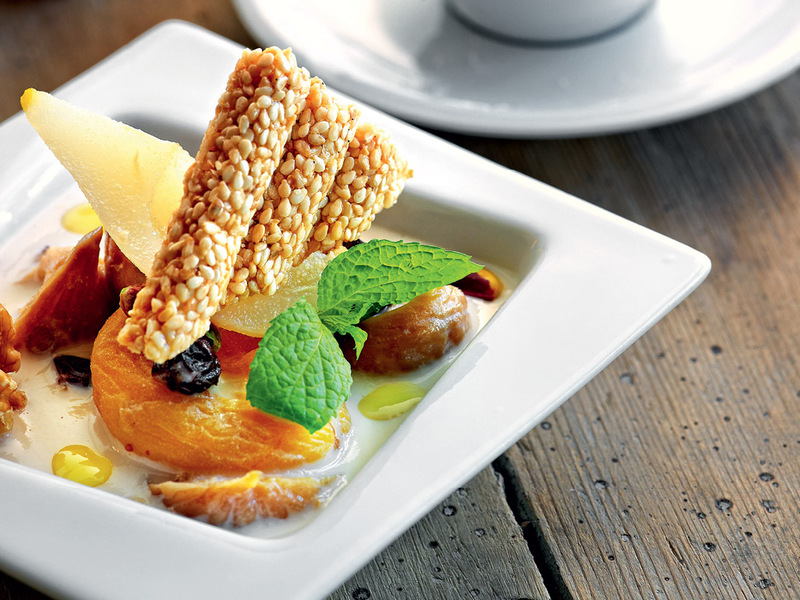 Serve the dried fruits and nuts on a dish and carefully pour the milk on top. Refrigerate to thicken. In the meantime, poach the pear in wine together with the cinnamon stick. Remove the dish from the fridge and place the poached pear and the pasteli on top. Decorate with fresh mint.